In last month’s column, I made a plea that the Cities around Lake Minnetonka ought to provide more funding toward the control of milfoil. Indeed, since then, the Cities of Greenwood and Tonka Bay each committed $5,000 toward the proposed milfoil treatments in St. Albans and Gideon Bays and the Cities of Mound and Shorewood have again budgeted money toward the Phelps Bay treatments. In this column, I provide a breakdown of the total funding toward aquatic invasive species (AIS) prevention and control, and present our views on where future funding ought to go. AIS prevention programs in 2009 included DNR watercraft inspectors and the I-LIDS video monitoring with approximate budgets of $49,000 and $7,000, respectively. AIS control programs included the milfoil harvesters and the milfoil treatments in Grays and Phelps Bays plus plant assessments (pre-treatment) for Gideon and St. Albans Bays with approximate budgets of $100,000 and $146,000, respectively. Funding for these programs comes from public and private sources. The Lake Minnetonka Conservation District (LMCD) receives its general funding from a levy through the 14 Cities around the lake. In addition, the LMCD administers its Save-the-Lake Fund, which is maintained solely by private contributions. The Minnesota DNR provides grant funds for the inspectors, harvesting and milfoil treatments. Several Cities contribute to the milfoil treatments on some bays. Finally, the Lake Minnetonka Association (LMA) administers privately collected funds, mostly from lakeshore owners and businesses, which have supported AIS prevention and control programs. So, there are three public funding sources (LMCD, Cities and DNR) and two private funding sources (Save-the-Lake and LMA) that support AIS prevention and control on Lake Minnetonka. The Lake Minnetonka Association is proud of the support for AIS prevention and control provided by our members. Their support is voluntary and represents a substantial part of the total protection effort. 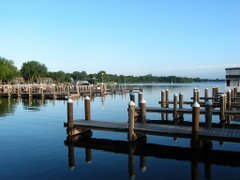 Lake Minnetonka is a public resource and its protection and management are critically important to sustaining the quality and value of this beautiful resource. The Lake Minnetonka Association, through the generous, voluntary contributions of our members will continue to do our share. We think our members’ support of the milfoil control program will likely remain high, as there is increasing demand and interest for our Milfoil-Free Minnetonka campaign. However, we think Lake Minnetonka is seriously under-invested for protecting Lake Minnetonka from new AIS. The Minnehaha Creek Watershed District is contemplating becoming involved in AIS prevention for Lake Minnetonka and other lakes in the District. We encourage and would welcome their participation from a watershed perspective. The $56,000 budget for AIS prevention is a pittance compared to the need and priority. For most AIS approaching Lake Minnetonka, there are no remedies or controls once they get into the lake. The LMCD’s share of this, $33,100, represents about 13% of their total municipal levy. The Lake Minnetonka Association believes this should be a higher priority and a greater portion of the funding dedicated to the conservation of the lake we love. We advocate for additional funding and believe that will need to arise locally, as there are limited state funds likely to be available – and no state funding through the newly-passed constitutional amendment monies. Lake Minnetonka is too valuable a resource – if we do not provide for its protection, we risk losing the treasure of our community. I want not acquiesce in on it. I regard as precise post. Specially the title-deed attracted me to review the whole story. Well I to but I contemplate the post should secure more info then it has.